Enerpac is introducing to Australasia its biggest-ever range of time-saving technologies focussed on improving safety and efficiency in the construction, energy, infrastructure and mining and petroleum industries. The man guiding the expansion – the business unit manager of the Australasian operations of Enerpac, Anders Mangen says technologies such as advanced torque wrenches and high reliability ZU4 pump families have helped produce an extraordinary rise in sales of Enerpac’s 700 bar technology, which packs more force into lighter and smaller tools that are easier and safer to use. According to Mangen the timing of the range expansion has been right because huge resources, infrastructure, energy and pipeline projects are looking for tools they can trust for safety, reliability and efficiency in rugged situations onshore and offshore. Now the company is extending the quality engineering brand into further areas of our industrial markets where Enerpac offers global expertise complemented by local support through our national network. Enerpac stocks Australasia’s one if the biggest selection of (700 bar) cylinders, in hundreds of models with capacities from 5-1000 tonnes for compact high-pressure power in lifting, pushing, pulling, bending and holding applications. 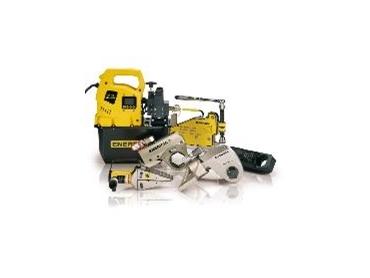 Enerpac’s range of time and cost-saving precision tools also includes new families of aluminium cylinders weighing half their steel equivalents, new Extreme Products designed for maximum corrosion and temperature resistance and the new generation ZE and ZU electric pumps with fewer moving parts that save power while extending reliability and serviceability even on remote sites with variable electricity supplies. Innovations in the Enerpac E325a industrial catalogue range from its highly portable families of professional bolting equipment to computerised synchronous lifting systems that one person can operate from up to a kilometre away to lift giant weights (including bridges, turbines, draglines and drilling platforms).